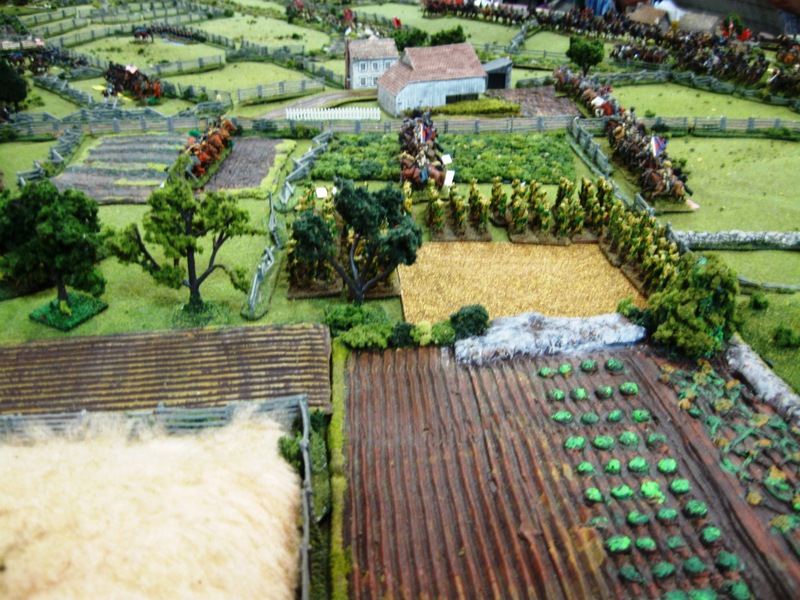 Here are a few photos from my 15mm Civil War wargame at Fall-In 2011 on Saturday morning in Lancaster PA. This view looks south from the northern edge of the battlefield toward the Rummel Farm (top center) and Cress Ridge (top right). We had 7 players for the game; all are long-time members of the Johnny Reb Gaming Society and are veterans of many Johnny Reb 3 wargames at HMGS conventions over the past decade. 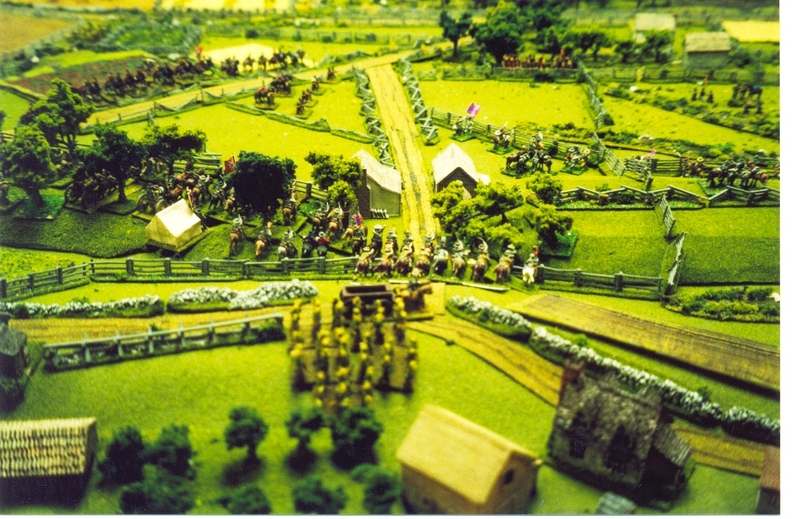 The scenario was adapted from my book Enduring Valor: Gettysburg in Miniature. Click on each photo to enlarge it for easier viewing and more details. I apologize for the picture quality; lighting was not great and I did not have a tripod set up (and autofocus was off unfortunately). At least you get an idea of the table layout. For more photos of Remembrance Day 2009 in Gettysburg, please see Part 1 of my Cannonball blog, sponsored and hosted by the York Daily Record newspaper. Flames Beyond Gettysburg now shipping to customers! I am now filling orders for personalized autographed copies of the newly released Flames Beyond Gettysburg: The Gordon Expedition, June 1863. These are $23.95 plus $5 shipping, and tell the story of the Confederate invasion of southern Pennsylvania in the week immediately before the Battle of Gettysburg. You will much better understanding Day 1 at Gettysburg after you read this book!!! It sets up how and why the Confederate troops were in the locations in which they began the Battle of Gettysburg. PayPal accepted! Priority mail shipping. Dioramist Dennis Morris now has a new website! Master Gettysburg dioramist Dennis Morris has set up a new website with photos of some of his very nice HO scale dioramas of the Second Day of the Battle of Gettysburg. Filled with vignettes, battlefield descriptions, and troop movements, his website is sure to be of interest, especially as he expands it and adds more photos and text. 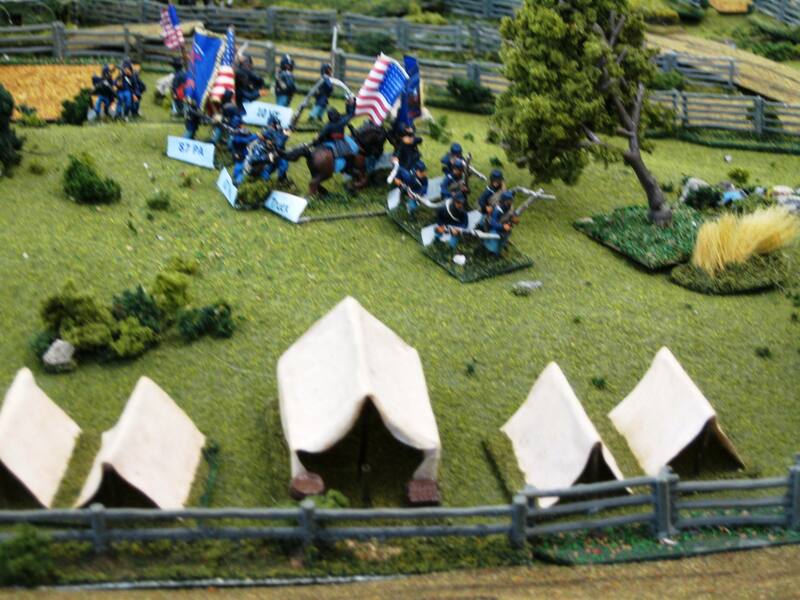 Dennis is a New York-based hobbyist who has been slowly expanding his Gettysburg diorama since its modest beginning in 2005. Some of his excellent photos grace my Brothers Divided wargaming scenario book, which is now on sale from Marek/Janci Design. Check out what he has in place already! 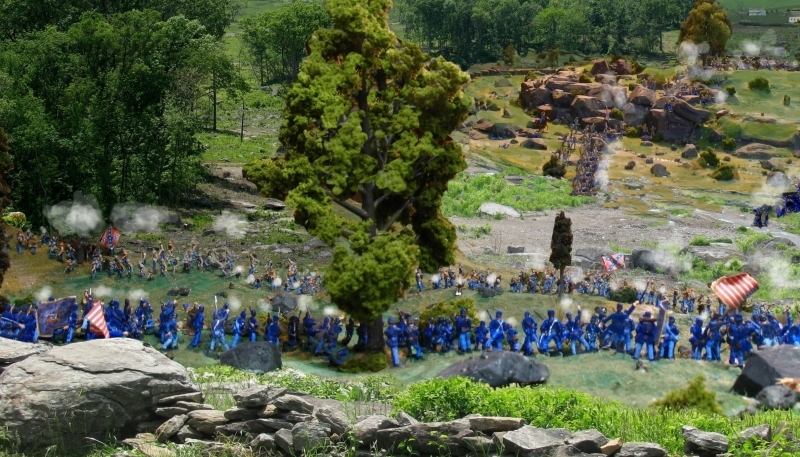 New York hobbyist Dennis Morris has just completed another section of his massive diorama of the Battle of Gettysburg. Here is a view of the Union defenses on Little Round Top, looking toward embattled Devil’s Den. 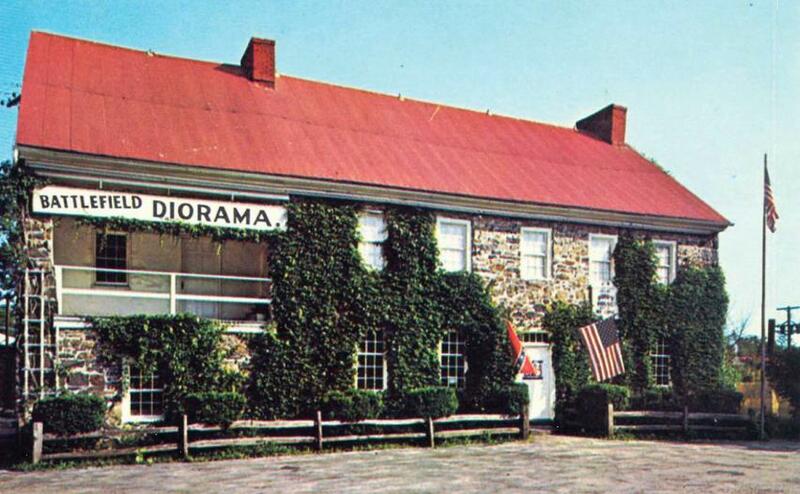 A vintage photograph of the Gettysburg Battlefield Diorama in the old Dobbin House on Steinwehr Avenue in Gettysburg. A Charge! 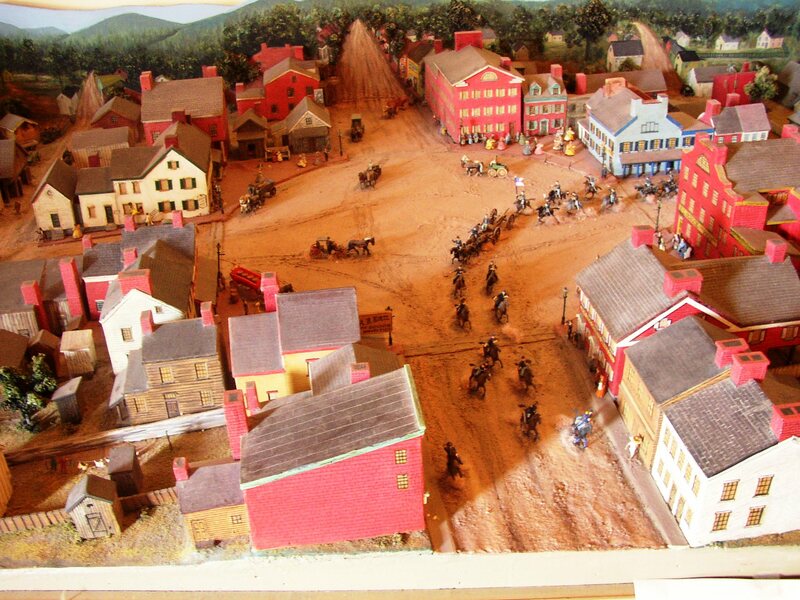 reader sent me some interesting information on the Gettysburg Diorama that used to be located in the historic Dobbin House in Gettysburg, Pennsylvania. 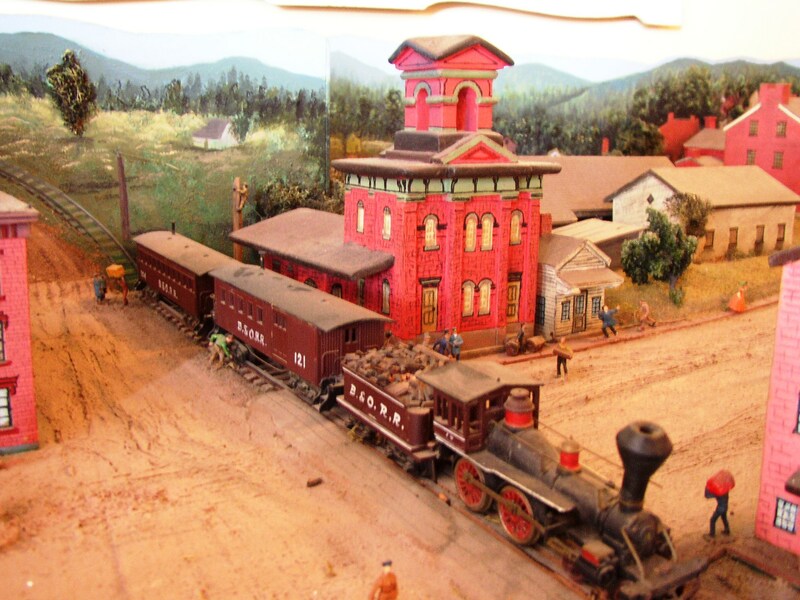 The diorama was constructed by a York, PA, man, Curvin Heiss and his son. Heiss hard carved the molds and then cast the figures. He and his son Curvin Jr. then hand painted the 54mm Civil War figures. Elements of Albert Jenkins’ brigade of Confederate mounted infantry from (west) Virginia form dismounted skirmish battle lines on Cress Ridge (right center) during the Battle of Gettysburg. In the foreground is Col. John R. Chambliss’s mounted brigade on Hoffman Ridge. Photo of a game presented at Historicon a few years ago by Scott L. Mingus, Sr. In the center of the above photograph is the Rummel farm, which changed hands several times during the often savage encounter. To the upper left along the Stallsmith farm lane is the Virginia brigade of FitzHugh Lee, which will later launch a major mounted attack that will be met by a pair of Michigan regiments. At the right center, dismounted Federals of George Armstrong Custer’s 6th Michigan skirmish with Jenkins’ men, now commanded by Lt. Col. Vincent Witcher. In the distance (top right corner) is John McIntosh’s Union brigade, which includes the 3rd Pennsylvania Volunteer Cavalry. 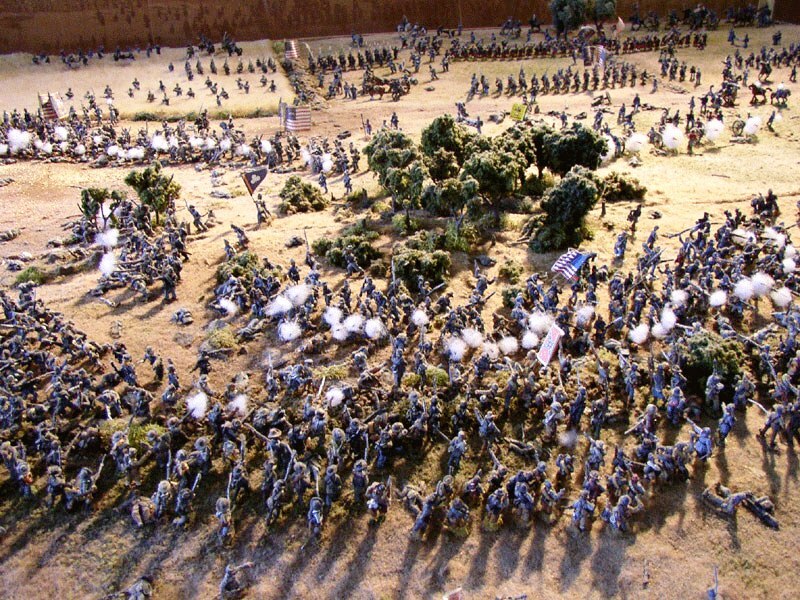 For the last couple of years that the old Cyclorama building was in use at the Gettysburg National Military Park in Gettysburg, Pennsylvania, the lobby was graced by a large and quite impressive Civil War diorama of Pickett’s Charge. 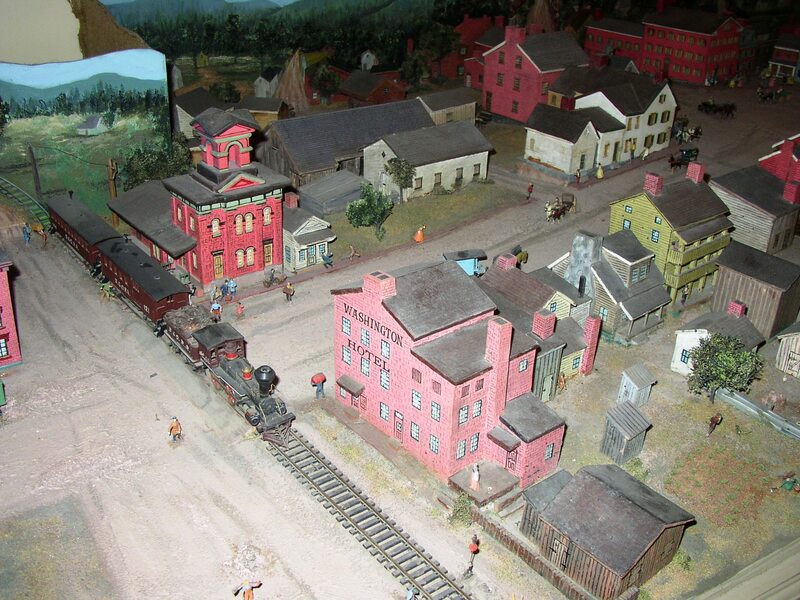 Constructed and painted by a local hobbyist in Gettysburg, the collection is no longer on public display. However, Larry Reber of Gettysburg Soldiers took a few photos to memorialize this now defunct diorama. Here are some of Larry’s photos. A model passenger train sits at the Gettysburg Depot in this photograph by Larry Reber from GettysburgSoldiers.com of the Union Drummer Boy’s HO scale diorama of the town of Gettysburg on June 30, 1863. The actual last train from Gettysburg that afternoon carried several government officials to safety, as well as those citizens who wished to leave the area to avoid having to stay in their homes during the impending combat. 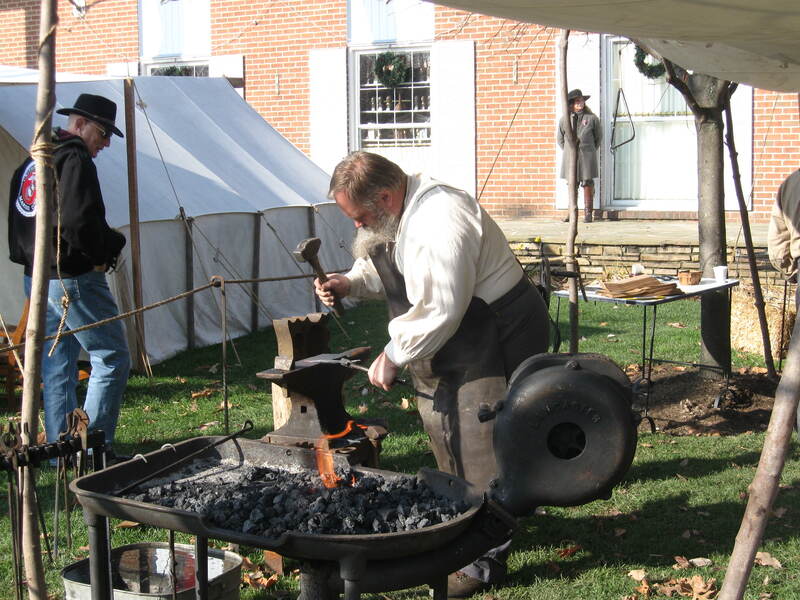 Many of Gettysburg’s residents had already fled, although more than a thousand are estimated to have been present during the Battle of Gettysburg on July 1-4. As mentioned in the previous post, this classic diorama dates from the early 1960s from the Charley Weaver Museum and is still be best 3D rendition of Gettysburg as it may have looked during the Civil War. However, the diorama is rife with factual errors, including the above scene. The train station was not painted a reddish color; see my previous post on the model diorama of the 1863 Gettysburg train station. The model uses a stock locomotive; it is not of the same make and model as what the actual railroad used in 1863, and it is painted in the livery of the Baltimore & Ohio RR instead of the Gettysburg Railroad. Still, for all of its faults, the diorama is well worth a look the next time you are in Gettysburg. Stop by the Union Drummer Boy on Baltimore Street.